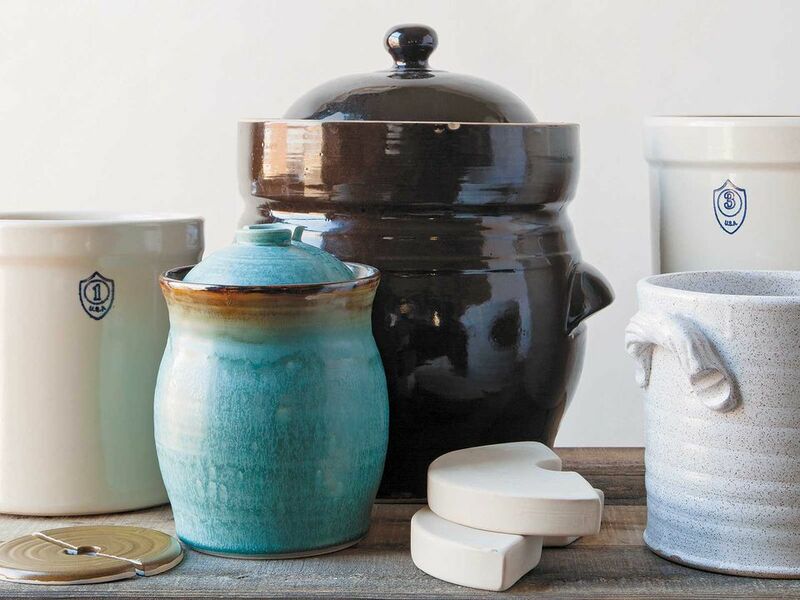 There are two primary types of ceramic crocks available in the West. Each has advantages and disadvantages to consider before purchase. Water-sealed crocks, sometimes referred to under the brand name Harsch crocks, make for a very easy ferment. They are generally more expensive than their open crock counterparts, but they come with a lid and often with weights that create the perfect fermentation barrier. No air enters the crock once the water “seal” is poured, but CO2 created during fermentation easily bubbles out. Batches made in water-sealed crocks rarely accrue a layer of Kahm yeast during fermentation. They can be somewhat challenging to clean after fermentation, depending on their size. Ideal for: This crock is ideal for fermenters with a deep and abiding fear of surface molds or yeasts; fermenters who want to set it and forget it; fermenters who want to create larger batches of favorite jarred ferments. It’s perfect for sauerkraut or classic cukes. Special tip: Check the moat around your crock about once a week to make sure there’s still water in there. If it seems a bit low, top it off with fresh water. If the moat dries out completely, the seal will be broken and air will be allowed to flow into your crock. Opening the crock also lets air in, so it’s better to keep the lid on until the end of fermentation when using a water-sealed crock. Open crocks are usually less expensive than water-sealed crocks and their wide, cylindrical shapes make it easy to fit in and position a variety of larger pieces and whole vegetables. Weights and lids often need to be purchased separately and can dramatically raise the cost of an open crock. Open crocks that are not covered with a fitted lid and left undisturbed are prone to developing a layer of Kahm yeast, the harmless yeast that appears when a ferment is exposed to the air. Depending on their size, open crocks are quite easy to clean, since their bases and openings are the same diameters. Ideal for: This crock is ideal for farmers and those with a large garden. It’s perfect for fermenting whole vegetable recipes. Special tip: It’s better to start open crock batches, especially with whole vegetables or larger pieces, during cooler periods to avoid surface yeasts. Even during normal or cool temperature periods, checking the surface of the crock every few days and skimming off any Kahm yeast that may have appeared on the surface is a good bet. Kahm isn’t harmful, but if mold forms in a thick layer, it imparts unpleasant flavors and can cause issues with acidity, which would be problematic. If you develop true mold (that isn’t colorful), it’s not necessarily a reason to throw out the contents of your crock. Skim the mold, ladle some brine or veg from as deep in the crock as possible, and use a pH strip to test acidity. If the pH is 4.0 or below (as measured with a strip), you may safely eat the vegetables in the crock if they taste good. When fermenting in crocks, accurate salt measurements becomes more important. When salting vegetables for the jar, measuring rather than weighing is a totally reasonable choice. While measuring may result in a gram or three of difference for a jar, the larger scale of crock fermentation makes these “small” variations that occur between measuring vs. weighing and using one salt type vs. another much more pronounced. Furthermore, inconsistent salt levels for smaller batches have low stakes. If you use a little too much or too little and your pint of pickles is too salty or too soft, it’s not that big of a loss. If you’ve filled a crock with 45 pounds (20 kg) of cabbage, on the other hand, you might be a bit more peeved if that particular batch doesn’t turn out. If you’ve invested in a crock, investing a small amount in a digital gram scale may well be worth it for the accuracy it provides. If you are an experienced fermenter, accustomed to salting to taste, you can absolutely continue that practice in crock fermentation. For most things you’ll put in your crock, a heavy weight is very useful. If you’re selecting household items or crafting your own, remember that materials that don’t corrode, get moldy, or expand when wet are your best options. Avoid wood and metal and make sure that your weight fits comfortably through the narrowest part of your crock. Things move around during fermentation and a weight that’s too large could potentially damage your crock. Tannins added to a batch of pickles can make all the difference between crispy and floppy. There are several safe sources of tannins that you can add to your pickles for crisp and crunch. Grape leaves: Grape leaves are a go-to source for tannins. They are easily found in most grocery stores, and they do not impart flavor or bitterness. They do the work of keeping pickles crispy quite well. If buying pre-salted leaves, soak them in room temperature water first to leech out some of the salt. Tea: Black tea is the best choice from a crispness standpoint, but it also imparts the most flavor. Sometimes that’s a plus, but consider whether it’s a good fit for the particular recipe. Berry leaves (raspberry, blackberry, or strawberry): Raspberry leaves are the best berry tannin option. They work wonderfully but are challenging to find if you don’t grow your own raspberries. Red wine: Wine works well in small doses, but it should not be used in quantity because the alcohol can have a negative impact on lactic acid bacteria. The best results come from using a maximum of 1 tablespoon (15 ml) per pint (500 ml) of pickles. Hops: Hops impart flavor and a bit of their characteristic bitterness, but they do help keep veggies from softening. Rosehips: The fruit of the rose plant is known for its high vitamin C content, but it is also very high in tannins. It imparts quite a bit of bitterness, so it is best used as a tannin source of last resort or in a pickle where added bitterness could be a plus. Store it in the cellar: Sadly, most of us don’t have root cellars and many of us don’t have basements. Even for those who do, crocks can be unwieldy, and full crocks can be downright back-breaking (or impossible) to carry. This option works best for small crocks. Ferments in open crocks can pick up some musty basement aromas, so water-sealed crocks are a better choice for basement storage. Once you’ve put your crock into the cooler climes, you can remove small amounts to store in the fridge (in a jar) and consume. If your basement stays below 60 F (15.6 C), consider a very long, slow fermentation period in a large crock that starts and ends down in the basement. Transfer to a jar: Transferring to a jar for fridge storage is a great option—provided you have the fridge space. With brined ferments, use a fork or slotted spoon to transfer the vegetables to one or more large jars, and then use a ladle to add a sufficient amount of brine to each jar so that the vegetables are covered. Close the jar and place in the fridge. It is very likely there will be a good amount of brine left in the crock. Eat it from the crock: Eating ferments right out of the crock may well be the easiest way to enjoy crock-fermented foods. Having said that, it does have its pitfalls. Every time you open your crock or remove the weights, you’re exposing your ferment to the air and increasing the chance that you will end up with some sort of surface activity (mold or yeast) as a result. Additionally, when left at room temperature, your vegetables will continue to ferment, becoming more acidic as the days, weeks, or months pass. If you decide to go this route, keep the crock in a cool place and be sure to only use clean utensils to pull edibles from your crock (and no double dipping)! It’s really a matter of finding a balance and figuring out what works for you. There’s no wrong answer, and a mix of methods can work wonderfully. Try jarring as much as you can reasonably store in the fridge and give to friends while continuing to eat small amounts from the crock.